All online marketing efforts are classified as digital marketing. This means Digital Marketing Specialists must possess a wide range of expertise to manage and coordinate varied forms of online marketing campaigns, in multiples platforms. Become an expert to handle all online marketing channels from our Digital Marketing Specialist program. Digital marketing is all about utilizing multiple online channels and assets to connect with current and potential clients. Such online channels and assets include; company website, blogs, e-books and white papers, infographics, email, search, social media channels (includes Instagram, Twitter and Facebook), earned online coverage (includes PR and reviews), online brochures and lookbooks, and branding assets (includes logos and fonts). The Digital Marketing Specialist should be skilled in managing such assets and online channels using well-coordinated tactics, like: Search Engine Optimization (SEO), inbound marketing, content marketing, social media marketing, affiliate marketing, Pay-Per-Click (PPC), marketing automation, native advertising, email marketing, and online PR. Currently, people are spending twice as much time online as they did 12 years ago. This means the audience that was originally accessible offline is now found online; hence, marketing efforts must also follow. Moreover, increased online purchases mean businesses which desire greater sales need to place their products and marketing efforts online. B2B companies can build online leads through digital marketing, which spur potential clients to contact their sales personnel. B2C companies also benefit by building an accelerated buyer’s journey from the first contact with the brand to purchase of products. Compared to offline marketing, digital marketing is much more effective at measuring ROI of all marketing efforts. It’s particularly valuable in attribution modeling (tracking your sales back to your customers’ initial touch point with your business). This helps Digital Marketing Specialists identify customer discovery trends in order to adjust and refine marketing strategies. That’s an immensely valuable benefit, considering that a strong sales and marketing alignment produces 20% annual growth rates for companies, compared to a 4% revenue decline with poor alignment. 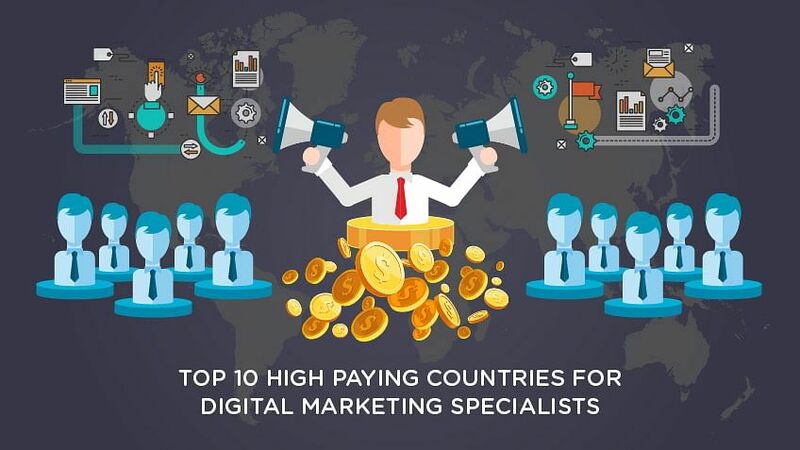 The most prominent countries in the online sphere typically offer the highest salaries for Digital Marketing Specialists. A Digital Marketing Specialist in Australia earns an average salary of AUD 82,166 (USD 62,444.52) per year. The average hourly wage is AUD 42 (USD 31.92) per hour. That’s about 1.4 times higher than the Australian median wage. Apparently, Australia offers quite lucrative wages, since entry level positions offer AUD 58,000 (USD 44,078.84), and experienced workers get paid as much as AUD 115,000 (USD 87,397.7). In Netherlands, the salary for Digital Marketing Specialists ranges from €34,000 to €57,000 (USD 38,765.1 – 64,988.55). Digital Marketing Specialists in the US earn a median salary of $47,853 per year. On the low end, such professional earn $35,122, which increases to $63,810 for top professionals. 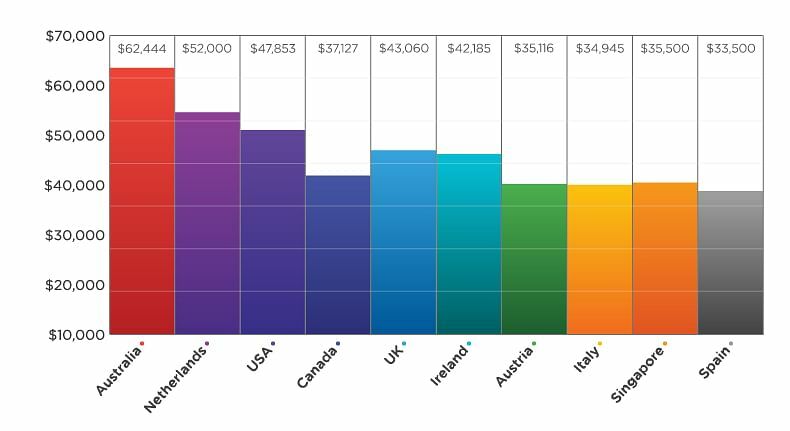 According to PayScale, the median salary for Canadian Digital Marketing Specialists is C$47,818 (USD 37,127.22). Here, entry-level professionals can expect a salary of C$36,003 (USD 27,953.73), whereas experienced workers get a high of C$67,810 (USD 52,649.56). Neuvoo estimates the average Digital Marketing Specialist salary in Canada to be C$55,690 (USD 43,239.26) per year. That’s C$29 (USD 22.52) per hour, which is about 1.7 times more than the Canadian median wage. In the UK, the average Digital Marketing Specialist’s salary is £33,393 (USD 43,060.27) per year (£17 (USD 21.92) per hour). Starting professionals earn £23,000 (USD 29,658.5); whereas, professionals with years of experience get as much as £47,000 (USD 60,606.5). Ireland offers Digital Marketing Specialists an average salary of €37 000 (USD 42,185.55) per year. This equates to an hourly wage of €19 (USD 21.66), and it’s about 2 times more than Ireland’s median wage. €26 000 (USD 29,643.9) is the typical entry level wage, and €52 000 (USD 59,287.8) is the expected salary for the most experienced workers. In Austria, Digital Marketing Specialists earn an average salary of €30,800 (USD 35,116.62) per year (€16 (USD 18.24) per hour). This ranges from €22,000 (USD 25,083.3) at the entry level, to €43,000 (USD 49,026.45) for skilled workers. Being a Digital Marketing Specialist in Italy, you can expect an average salary of €30,650 (USD 34,945.6) per year or an hourly wage of €16 (USD 18.24). That’s almost 2 times the average salary in Italy. Salaries start at €21,000 (USD 23,943.15), going up to €43,000 (USD 49,026.45) for experienced professionals. Digital Marketing Specialists in Singapore earn between S$38,880 and S$59,760 per year (USD 28,132.14 – 43,240.15). The variation in pay is mostly based on experience level, industry, and company size. Digital Marketing Specialists in Spain earn between €27,000 and €31,000 (USD 30,784.05 – 35,344.65) per year. Through a gradual process, it’s possible to advance to high-level positions, starting from a career as a Digital Marketing Specialist. Beginning as a Digital Marketing Specialist, you can move on to the position of an Online/Display Advertising Manager, and then become the Head of Online/Display Advertising. Alternatively, you can progress from a Digital Marketing Specialist to a Digital Marketing Manager, and then to the Head of Digital. Digital Marketing Specialists are an in-dispensable part of modern firms due to the critical role of digital marketing in delivering an organized sales process and sustained revenues. This is why many countries offer competitive salaries for such professionals. Want to grab a high paying digital marketing role, our Digital Marketing Certification program should help.